Research on TB and leprosy in nonhuman hosts suggests that these pathogens might be prevalent in other nonhuman primates. One of the projects I worked on during my Ph.D. aimed to assess whether we can screen non-invasive samples such as cheek swab samples for determining mycobacterial infection in nonhuman primates. We screened a population of wild tamarins from the Amazon region of Peru using quantitative PCR assays to test for the presence of TB and leprosy. These samples were collected by Dr. Mrinalini Erkenswick Watsa and Dr. Gideon Erkenswick Watsa (click here to learn about their work with primates in Peru). The objective of this project was to reconstruct full human mitochondrial genomes from dental calculus samples acquired from human skeletal remains. 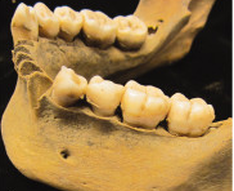 We reconstructed complete mitogenomes for six individuals from the 700-year old Norris Farms #36 cemetery, using ancient DNA extracted from dental calculus, in conjunction with target enrichment and next-generation sequencing methods (Ozga et al. 2016). Our results suggest that dental calculus is a viable alternative source of human DNA that can be used to reconstruct full mitogenomes from archaeological remains, especially in cases where conventional samples, such as bone, are not available or are not sufficiently well-preserved for ancient DNA analyses. For my Masters thesis, I studied the influence of host (human) genetics on the outcome of Dengue virus infection. My advisor on this project was Dr. Kalichamy Alagarasu, National Institute of Virology, India. We studied single nucleotide polymorphisms in the vitamin D receptor gene and the oligoadenylate synthetase gene cluster, involved in the innate immune response. Our results suggest that polymorphisms in these genes are associated with differential outcomes of Dengue virus infection among Indian populations: certain haplotypes may confer protection whereas others may increase the risk of severe dengue disease (Alagarasu et al. 2012; Alagarasu et al. 2013).